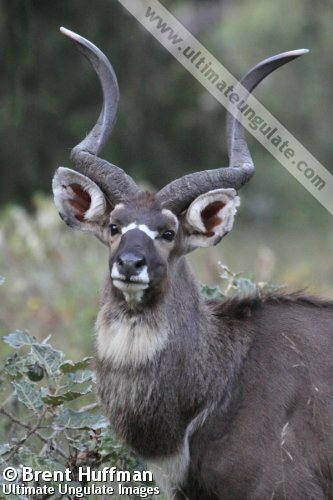 Mountain nyala are generally a grey-brown color, but, since the coat is short and glossy in summer and shaggy in winter, the color can appear quite variable. Males tend to be darker, and young animals often have golden undertones to their coat. 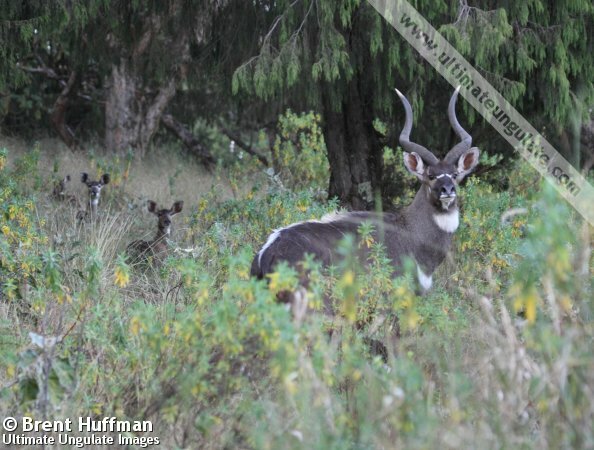 There is usually a pattern of white spots and a few stripes on the flanks. On the face, there is a distinctive white chevron between the eyes and two white spots on each cheek. There are two patches of white on the underside of the neck, a "bib" at the throat and a narrow crescent on the chest. 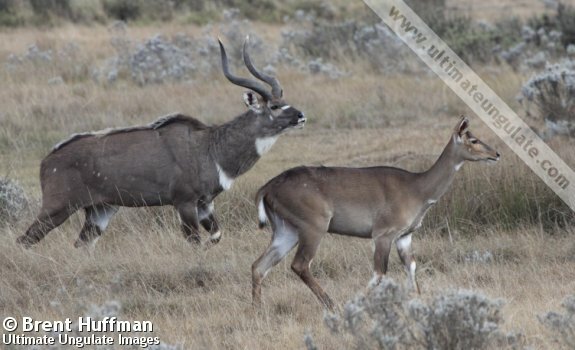 Males are larger than females, and are easily distinguished by the presence of horns (the females are hornless). The horns are lyrate, usually with one and a half or two twists, and may grow up to 118 cm long. Greater kudu (Tragelaphus strepsiceros) males have a shaggy fringe on the throat and much longer horns with a distinctive corkscrew spiral. 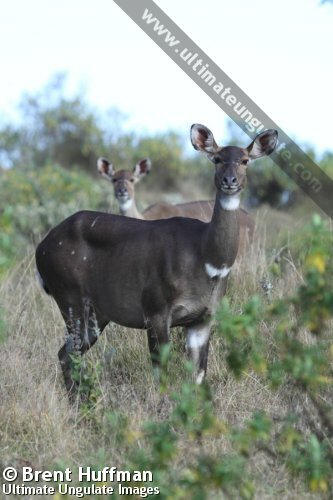 Both sexes are lighter in color than the mountain nyala, with well-defined vertical stripes on the body. Sexual maturity: Females at 2-3 years of age. Males may be mature at this time, but cannot win breeding rights until 5-8 years. 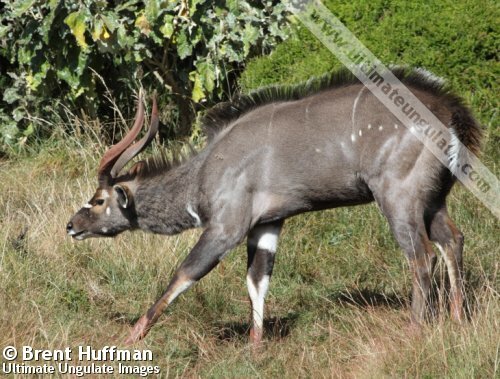 Mountain nyala may be born through the year, although there is usually a peak which coincides with climate (April to June in Bale, October to December in Arussi further north). The baby lies up in dense cover for a few weeks, being visited by its mother only for nursing. Young may remain with their mothers for two years. Mountain nyala are most active in the early mornings and late afternoons, although if undisturbed by humans they may be active at any time of the day or night. It is thought that this species may make seasonal migrations based on altitude, using the higher mountains in the dry season and the lowlands during the wet season. They are not territorial. There are two main sounds that this species makes: a hoarse grunt, and a clear bark which acts as an alarm call. When fleeing from a predator, the tail is flipped up, showing off the white underside. Family group: Small groups of 2-13 animals, principally females and young but often including a mature male. Old males are solitary. Diet: Leaves of herbs and shrubs, sometimes grasses, ferns, and lichens. Main Predators: Leopard, possibly lion and hyena. 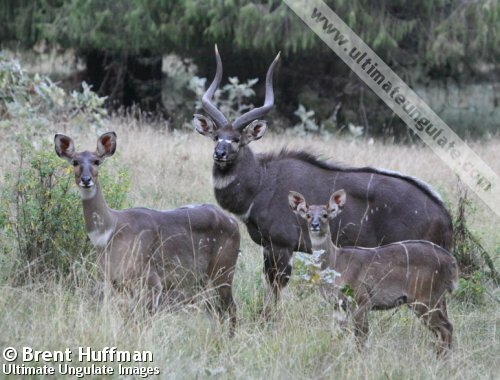 Mountain nyala are found only in central Ethiopia southeast of the Rift Valley (primarily around the Arussi and Bale massifs), inhabiting woodlands and grasslands between 2,000 and 4,000 m above sea level. 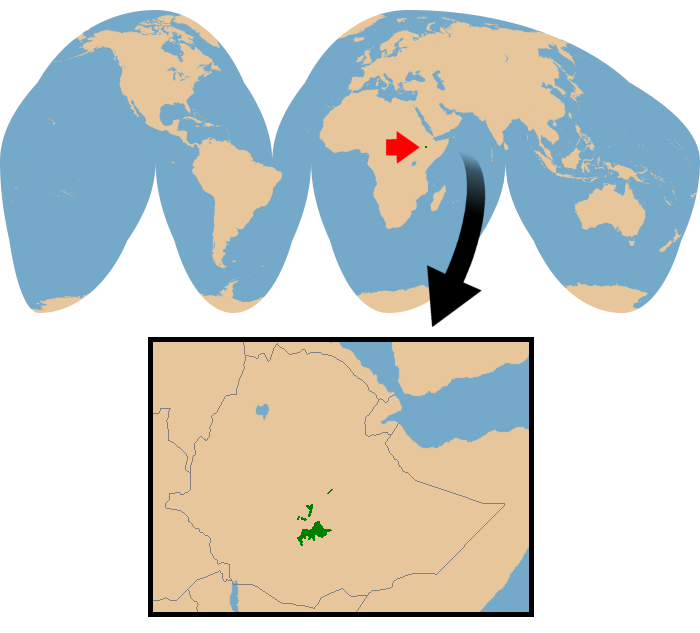 The approximate range is depicted in the map below. CITES Listing: Not listed (2009). Threats: Habitat loss (agriculture and human development), hunting by humans for food and horns. The estimated total population is around 4,000 animals.